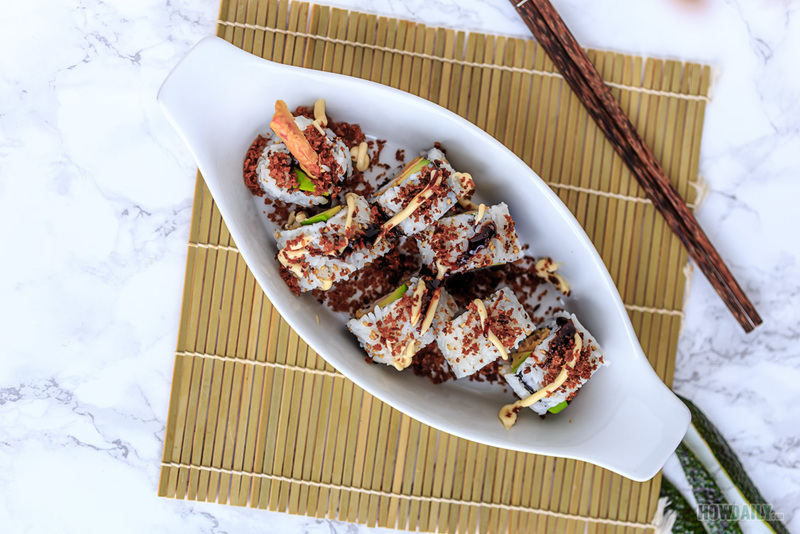 Introducing the Shrimp Tempura roll, one of the ever popular cooked maki rolls for sushi lovers. 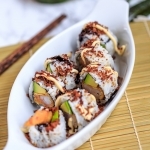 This roll is very easy to make and taste just as delicious too. This roll can be served as lunch, dinner or on a day out, as it can be eaten either hot or cool and still preserved its beauty: crispiness. In order for that to happen, first, you would have to make some shrimps tempura that will retain their natural sweet and crunch on the inside while crispy on the outside too. To have some fresh, add strips of avocado or even cucumber if you prefer. However the moisture from cucumber will quickly soak the shrimps outer coat so you should leave it off if the sushi is not served immediately. There will be no need for sauce, however, you could always top up with kewpie mayo and unagi sauce. Soy sauce could be used too if you need that sodium. I usually just skip the ginger when it comes to cooked sushi. Oh, and one note, make sure your batter mix and shrimp are cold, as in icy cold before frying. This will help with the always-crispiness too. Use carbonated water or beer if you happen to have one, otherwise, crushed ice+plain water will do to soften the batter. Unless you’re rolling for a large party (e.g. lots of frying to do), I would say skip the deep fryer, get the smallest sauce pan you could have out and pour oil to about half of its height instead. This will save you from wasting too much oil and still get the deep-frying result. In addition, you’ll always have some leftover batter, just throw whatever veggies you could find in and deep-fry together with the shrimp. These will be nice side dish along with that shrimp tempura roll. Some veggies are perfect with tempura batter includes: asparagus, carrot, sweet potato, green bean, zucchini, squash, mushroom, broccoli, eggplant, lotus root, red pepper, onion, etc. 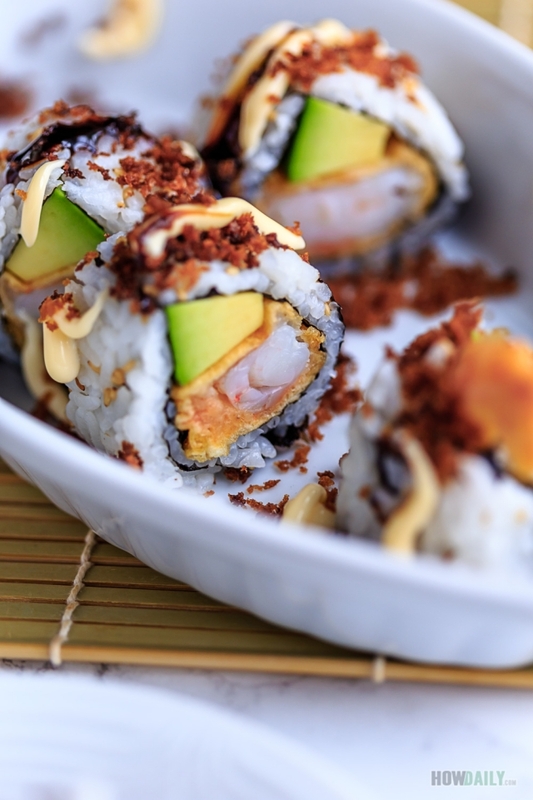 For alternative flavor, replace shrimp with other protein such as salmon, tuna, chicken; do the same tempura and roll. 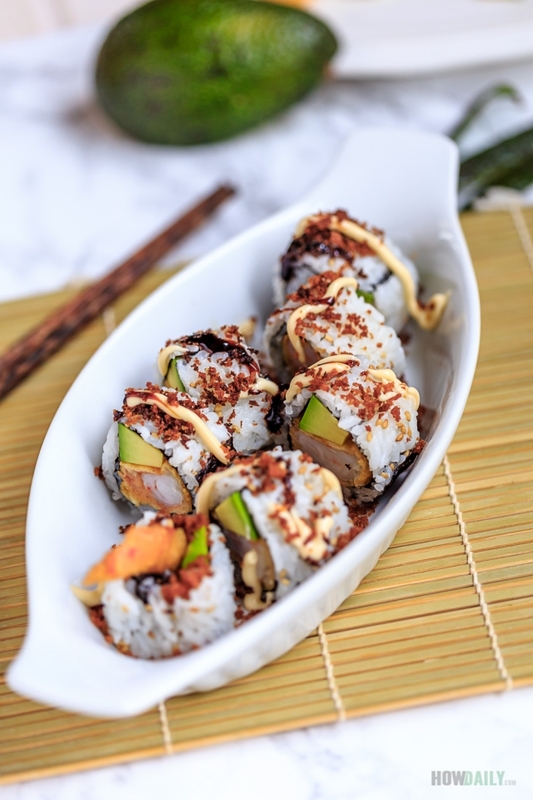 A beautiful golden crispy roll for all sushi fans. It is easy to make and can be served as quick appetizer too or for those picnic out. Peel and devein all the shrimps, leave the tails on and let sit to air dry a bit. In a wide enough container, mix 31/2 Tbsp of all purpose flour with 2 Tbsp cornstarch, 1/2 tsp baking powder and 1/4 tsp curry powder. Sprinkle on some salt and ground pepper, sift and mix evenly. Dredge all the shrimp in this dry mixture so that all shrimps are coated evenly, dust off excess powder. Pour 3 to 4 oz of icy cold (as in crushed ice + liquid) of carbonated water or plain water into the batter mix, whisk to smooth. Dip all the powder-coated shrimps into the batter. In a small saucepan, pour in veggies oil, and wait until the oil are hot enough. 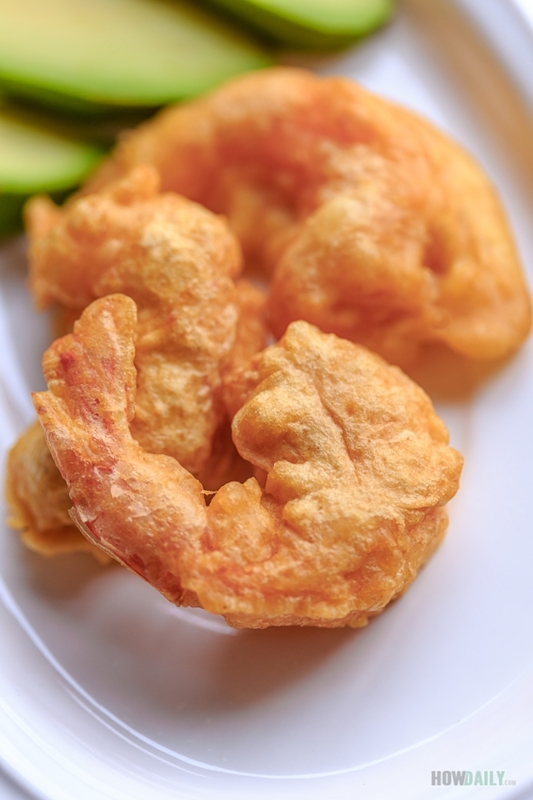 Deep fry all the battered shrimps until golden crispy. Remove tempura shrimp and transfer to parchment paper/towel to allow excess oil dripping. Remove sauce pan from the heat source, then add 4 Tbsp of bread crumb to the hot oil, they will brown immediately. Get a strainer to save these bread crumbs for decoration later. Slice the avocado quarter into 4 strips along its length. Wrap the bamboo mat with plastic wrapper all around. Place the nori's smooth side down over the rolling mat. Wet your hand with some vinegar as you knead & pan sushi rice all over the nori surface. Sprinkle some roasted sesame over the rice. Now turn the nori upside down, so that the black nori is now facing up. 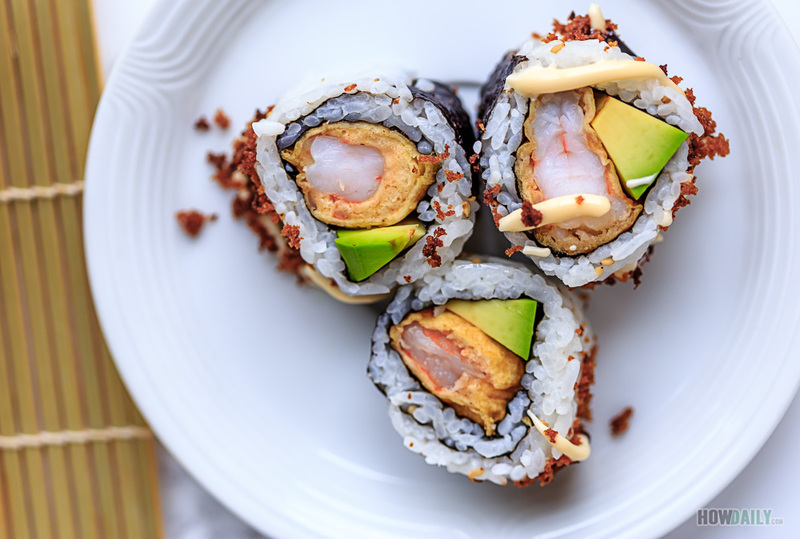 Arrange 3 shrimps and 2 avocado strips along the nori side. Roll the bamboo mat while gently apply some pressure to form its shape. Once the rolling is finished, gently tap and hold the mat over it for 10-20 second to keep the shape in place. Wrap a the roll with plastic wrapper and set aside. Repeat with the second rolls or more. Make sure your knife is clean, wet it with some vinegar/water solution, then cut across each roll while its plastic wrapper still intact. Once everything is cut, gently remove the plastic wrapper from each piece and transfer to serving plate. Sprinkle on the kewpie mayo, unagi sauce and the fried bread crumbs. It's now ready to serve.